The Pocahontas / Pocahontas II: Journey To A New World: Special Edition (Blu-ray + 2-Disc DVD) is on sale right now for $9.96 at Amazon. That's a great price for a Disney Blu-ray! It is showing as out of stock but you can still place an order and it will ship at this price when back in stock. Disney heroine Pocahontas sparkles in this captivating classic, available for the first time in breathtaking Blu-ray High Definition! 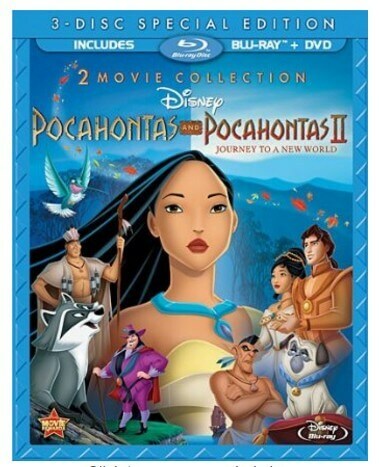 The rich animation and Academy Award(R)-winning music (1995, Best Original Musical or Comedy Score and Best Original Song, “Colors of the Wind”) burst forth with all the “Colors Of The Wind” in this amazing 2-movie collection of POCAHONTAS and POCAHONTAS II: JOURNEY TO A NEW WORLD — this 3-disc combo also features a DVD of each film! Fun and excitement are “Just Around The Riverbend” as Pocahontas and her friends Flit and Meeko find adventure at home and abroad in these sweeping stories from the earliest days of American history. This POCAHONTAS 2-Movie Collection delivers action-packed stories of adventure, friendship and courage that your family will cherish forever.|The look and style of the film were inspired by the filmmakers' numerous visits to Jamestown, Virginia, as well as by extensive research into the Colonial period.|At various stages of production, the creative team consulted with Native American scholars and storytellers to incorporate authentic aspects of the Powhatan culture into the film.|The movie won Oscars- for Best Score and Best Song (“Colors Of The Wind”).|Pocahontas, whose name means Little Mischief, is based on a real historical figure. She was born into a highly sophisticated Indian culture that had some knowledge of Europeans.|The use of strong vertical and horizontal imagery in the design springs from the tall vertical shapes of the Virginia pine forests and the vast horizontal landscapes.